We take a look at the last 90 years of its advertising. The brand has worked with JWT for the last 85 years – an almost unheard of agency tenure. 1920s were all about vitamins and using Vegemite in cooking. 1930s Vegemite was endorsed by the British Medical Association which meant the brand could be recommended by doctors. 1940s War time shortages and rationing mean Vegemite lovers are asked to cut back so there's enough to go around. 1950s Happy Little Vegemites jingle launched in TV and radio ads. 1960s Vegemite Vitality line still being used after 30 years but ads highlight Vegemite's benefits for kids, teens and adults. 1970s “Pass the Vegemite please mum' introduced as the brand focusses on kids. 1980s Aussie celebs Peter Brock, Helen Morse and Ken Rosewall roped in as part of the 'once a Vegemite kid, always a Vegemite kid' spots. 1990s Happy Little Vegemites is updated and Vegemite converts a bus into a giant toaster to give out samples around Australia. 2000's 'Spread the smile' and How you you like your Vegemite lines used and a partnership with Qantas sees Vegemite on-board overseas flights. 2010s happy Vegemite Day – limited edition packaging and a partnership with the Australian Olympic team for the 2012 London Games. 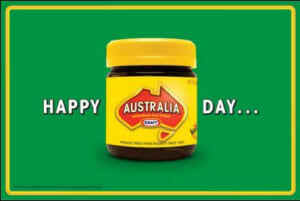 2013 Start with Vegemite campaign looks to increase usage and set the tone for the future of Vegemite. Vegemite is turning 90 today and celebrating with its #Vegemite90 social media campaign. We take a look at the last 90 years of its advertising. The brand has worked with JWT for the last 85 years – an almost unheard of agency tenure.